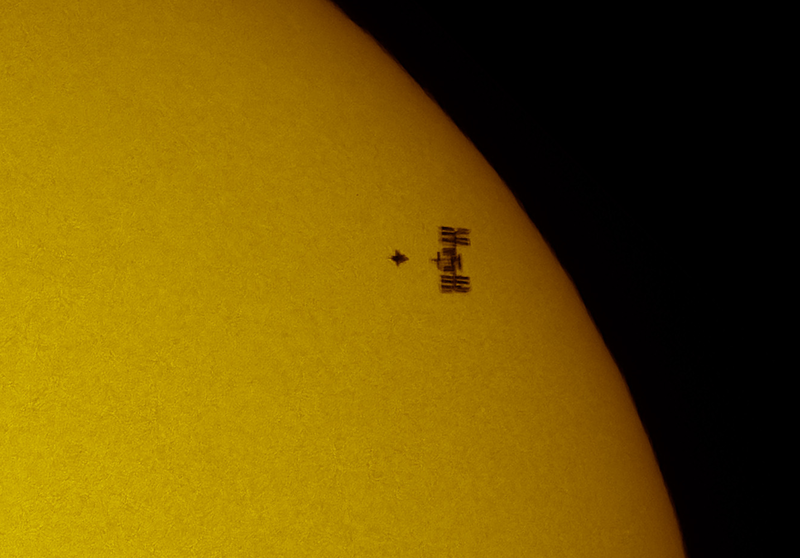 ISS and Atlantis stuhhle captured with solar disk (credits: NASA). International Space Station (ISS) is a habitable artifical satellite in low Earth orbit. This is the largest human-made body in low Earth orbit.The width of ISS is 108.5 m and length 72.8 m. It orbits about 400 kilometers above the planet so can often be seen with the naked eye from Earth. Aside for the Flight Dynamics Officers in NASA Mission Control Center, that use sophisticated computer software to predict when and where the ISS will be visible to people on the ground there is a software, which allows you to track the ISS across the Moon’s and Solar disk. 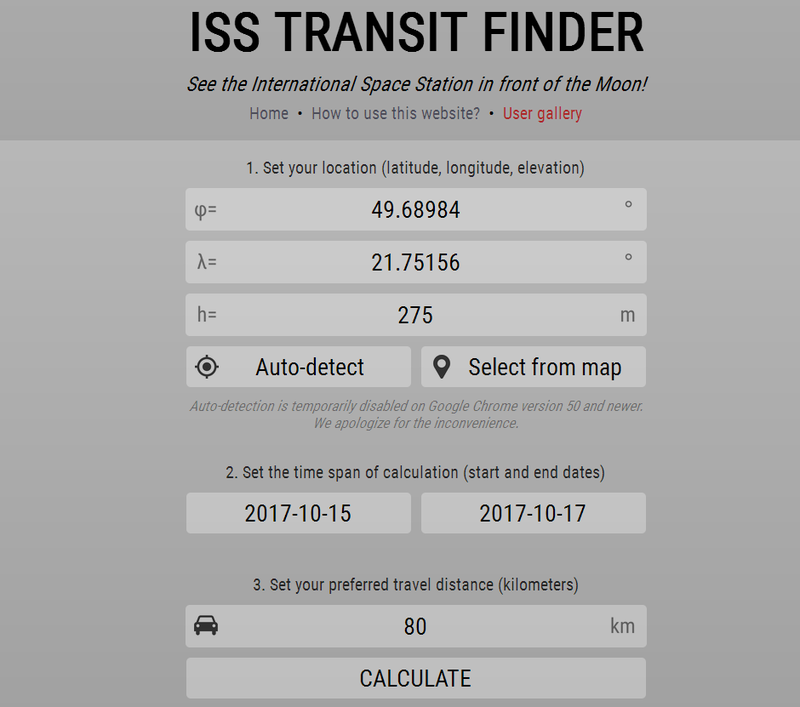 My colleague Bartosz Wojczyński, a member of Polish Society of Amateur Astronomers (PTMA) created an excellent web application designed to aid planning the observations of lunar and solar transits of International Space Station (ISS). To learn more click here. To plan the observation of ISS transit across the Moon or Sun you need to set 3 basic elements: your location, time span of calculation and preferred travel distance (pic. 1). Pic. 1. The transit-finder.com main interface. Pic. 2. 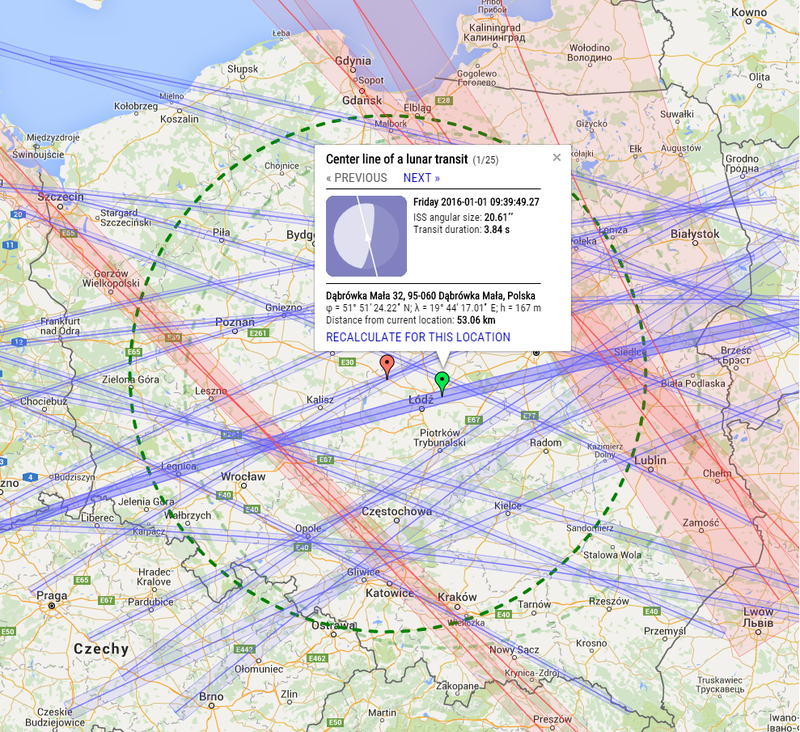 The solar transit, that is to be seen on Monday, 16th October between Kraków and Olkusz (transit-finder.com). Pic. 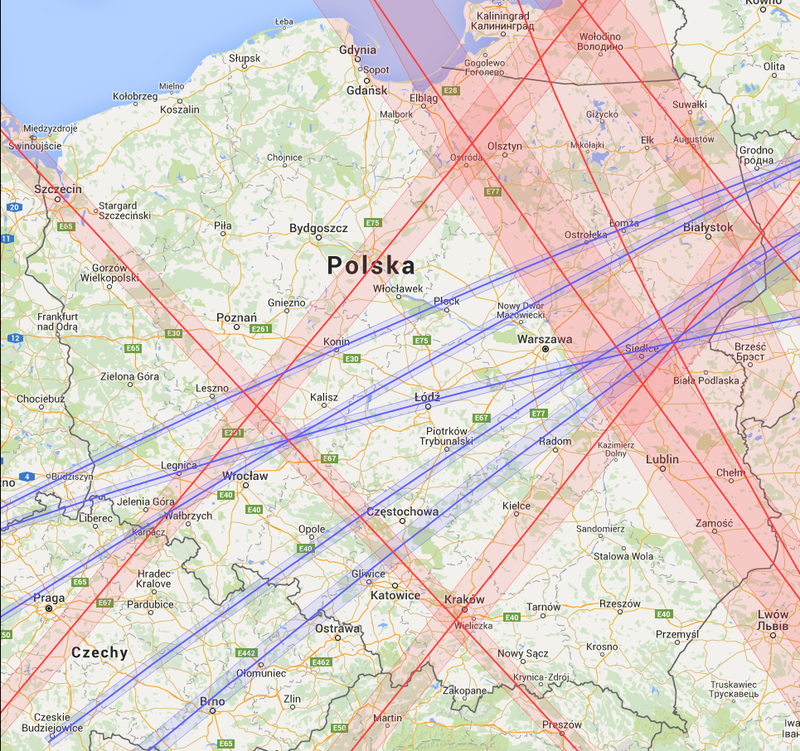 3 The solar and lunar transits seen across Poland calculated for a long period. Red patches – solar transits, blue patches – lunar transits. The placemark shows a local circumstances (transit-finder.com). Pic. 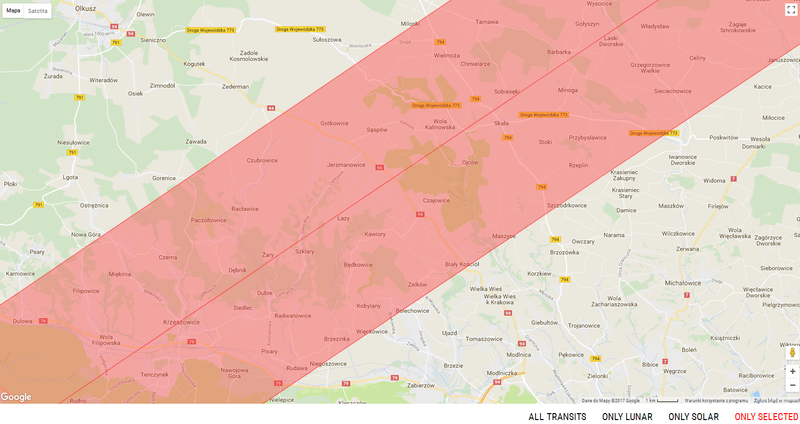 4 The solar and lunar transits seen across Poland, calculated for a long period (transit-finder.com). In the pictures above you can see many lunar and solar ISS transits. As you may have noticed some of the path are very narrow, another ones are quite width. It depends of the altitude of the Sun or Moon. 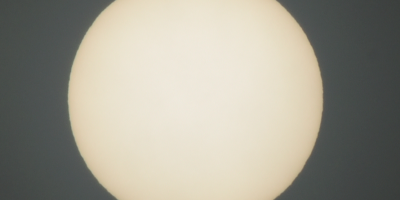 Usually when Sun is closer to the horizon, the transiting ISS is further from the observer and the occurence takes accordingly longer above wider area. The International Space Station is around 400 km above observer when near to the zenith. Once ISS is closer to horizon is relatively further from the observer, hence the transit takes longer. You can set your equipment in random position inside the path. 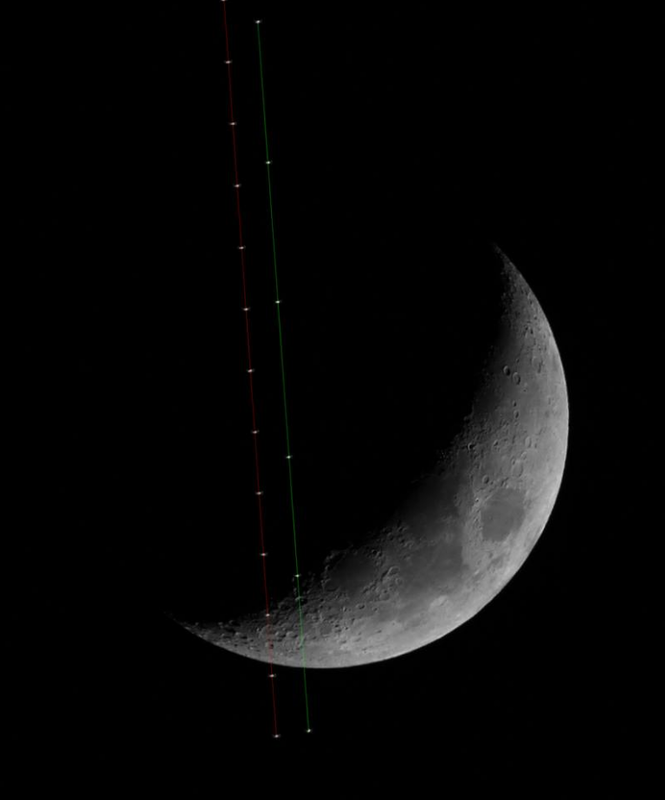 Depends on your location ISS will cross a different part of the solar or lunar disk (pic. 12). Pic. 5 The Parallax causes, that when we are further from the object, we need longer distance to see this object in different position. In case of ISS transit the observers from Viewpoint 1 and 3 are seeing 1 and 2nd contact of ISS transit. 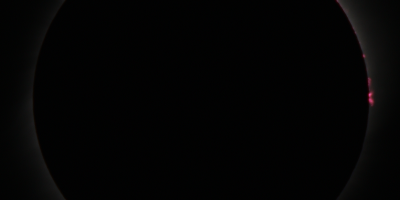 Observers from Viewpoint 2 and 4 are able to see 3rd and 4th contact. 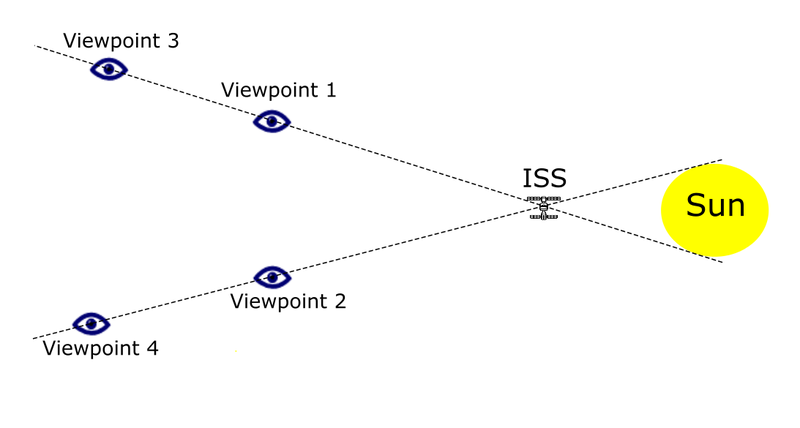 See the distance between both observers between Viewpoint 1,2 and Viewpoint 3,4. Observers located on Viewpoints 3 and 4 needs much more longer distance, from where ISS transit can be seen. There are relevant information to manage those observations correctly because transit ISS across the Sun or Moon usually last around only few seconds. It may occur maximum twice from your location in the span of around 90 minutes (ISS orbit period). Pic. 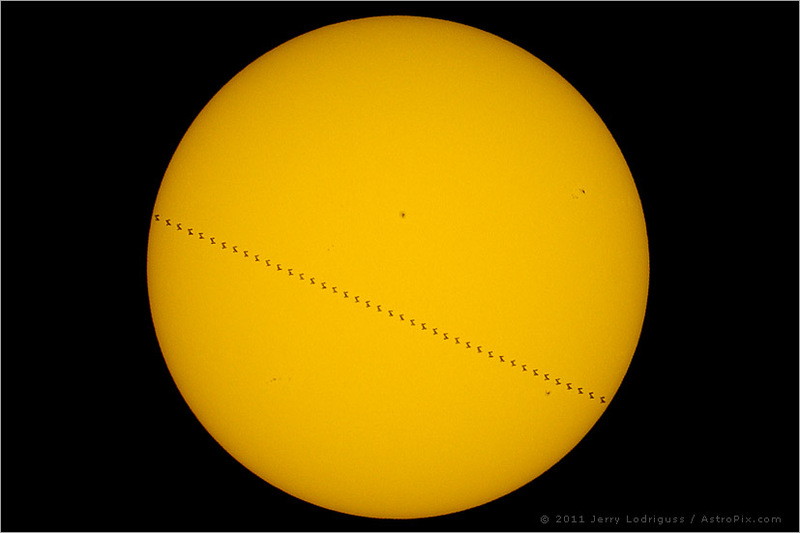 6 ISS transit across the Sun in 2011 (phot. Jerry Lodriguss, astropix.com). Pic. 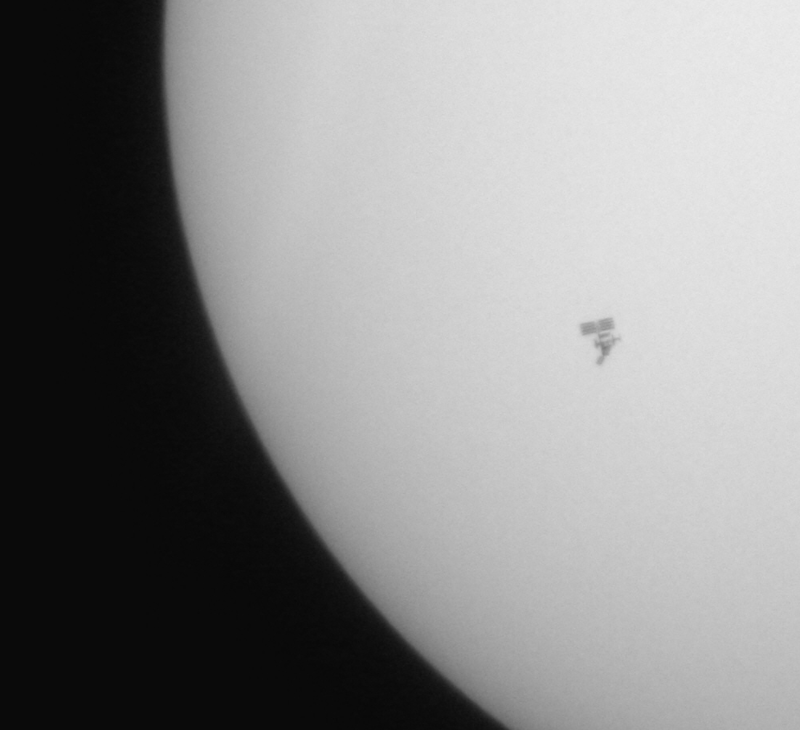 7 ISS transit across the Sun in 2008, cropped picture (phot. Martin Wagner, apod.nasa.gov). Pic. 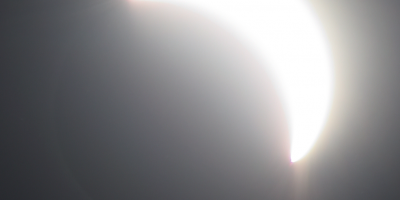 8 ISS transiting across the Sun with Space Shuttle Atlantis in 2010, cropped image (phot. Thierry Legault, apod.nasa.gov). Pic. 9 The double transit: ISS and Mercury on 9th May 2016 (phot. Thierry Legault, astrophoto.fr). 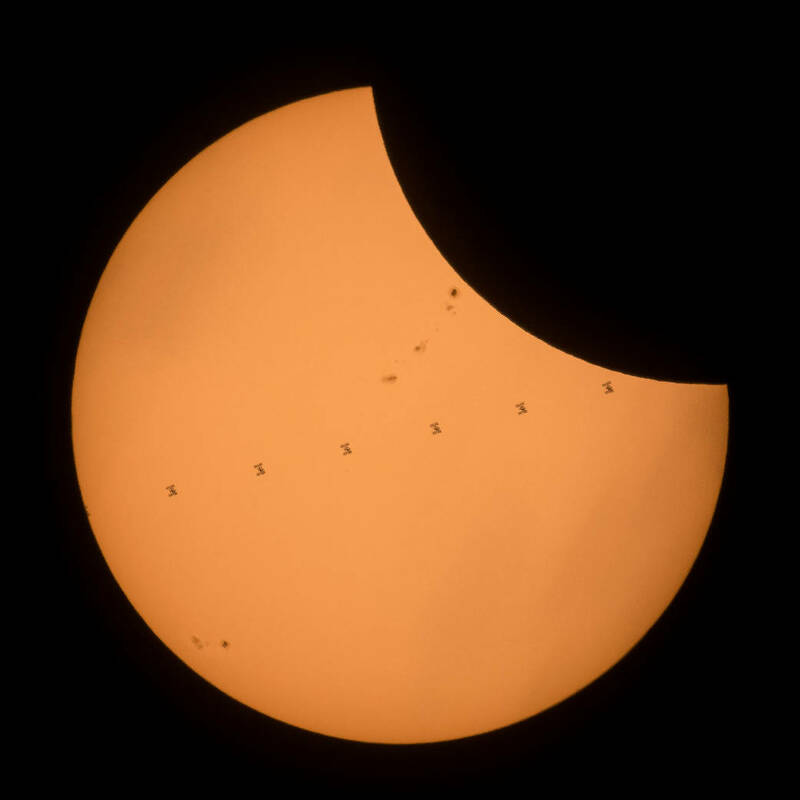 Very nice pictures has been taken during the Great American solar eclipse, when ISS transit occured with nearly 30% partial phase. Pic. 10 ISS transit across the eclipsed Sun on 21st August 2017 above western Wyoming (phot. Bill Ingals, nasa.gov). Pic. 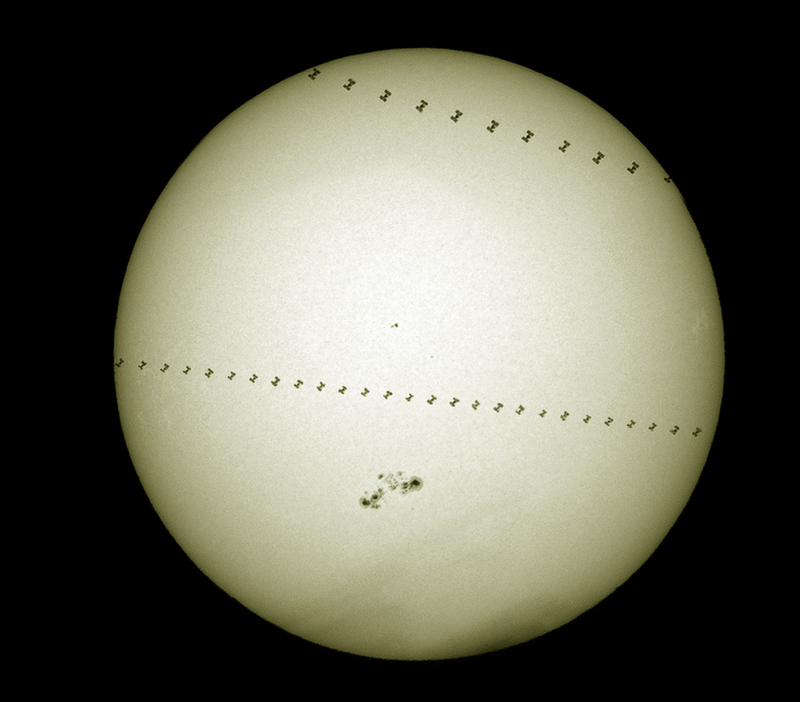 11 Double ISS transit seen from Schmalenbeck in Germany on 22nd August 2015 (phot. Hartwig Luethen, apod.nasa.gov). 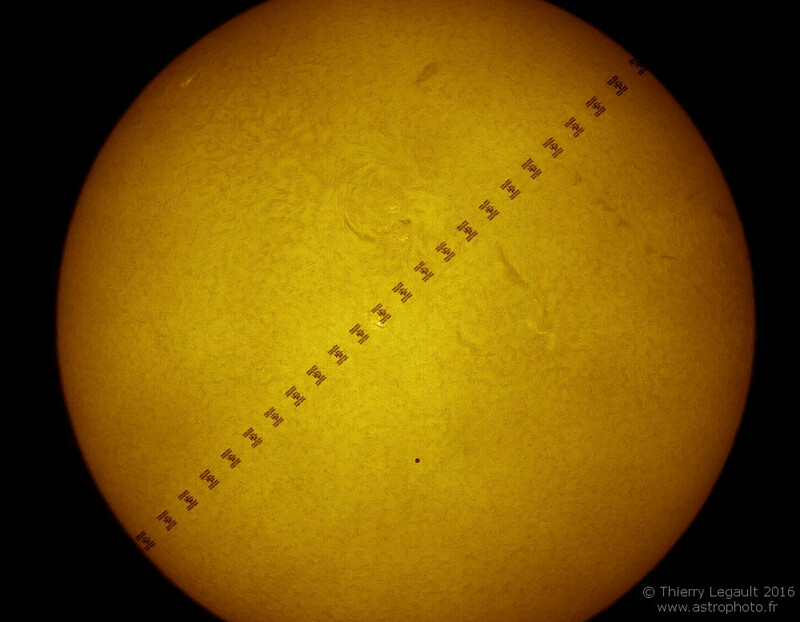 ISS transit occurs usually on a narrow path. As I said before depends on your location within the path the ISS will cross a different part of the solar or lunar disk. Due to narrow path the difference in transit is clearly visible even on short distance. I am giving an live example below, where my colleague Bartosz Wojczyński with his friend captured the ISS lunar transit in the 550 m distance. Pic. 12 The ISS lunar transit captured from different positions within approx. 550 m distance on 1st April 2017 (phot. Bartosz Wojczyński & Jakub Kowarczyk).